Exciting stuff happening around here! I'm back from Costa Rica - had a WONDERFUL time. Now I'm home & headed for Epcot for the International Festival of the Arts. I have four more appearances there- tonight (February 10) 5-7pm at the Pop Gallery Tent, tomorrow (February 11) 5-7pm at Disney's WonderGround Gallery Tent, and then the same again next weekend (February 17 & 18th). Click here for event details! And finally - I have a bunch of new ACEO cards up for auction, each also starting at just one penny. Tiny 2.5x3.5" art trading cards in the form of hand embellished canvas giclees - each is signed, dated, hand accented & numbered (numbered only #1 of 1, since only make ONE) in acrylic paint - you can see this new collection of cards (some you have never seen before!) here on eBay. And yes - the Epcot International Festival Of The Arts continues! I will be there in person for four more dates - February 10, February 11, February 17 and February 18th. Even when I am not there in person, my artwork will be! Basically I'll be either at the Pop Gallery tent (with my personal artwork) on some nights and then at the WonderGround Gallery tent (with my Disney character art) on other days. Click here for event details. ©Disney & the Hamilton Collection - a new figurine series! Adorable limited edition 3.5" artist's resin figurines, and yes - they'll also have the little Black Pearl shelf for them to sit on as shown! 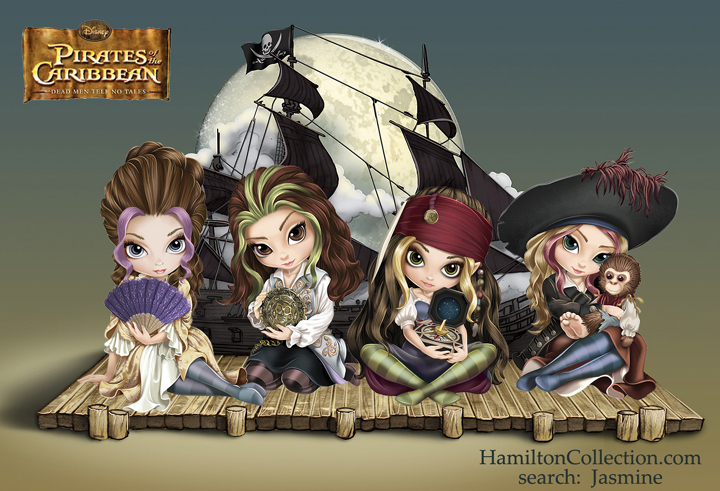 SO excited for this one, and right now US customers can pre-order the figurines starting with the girl dressed up as Captain Jack Sparrow at the HamiltonCollection.com website here - (or go to HamiltonCollection.com and just search "Jasmine") or search item 9907139001 . Since it's in the pre-order stage it's only on the US website at first (don't worry Canada & everybody else, when they go into production months down the line they will pop up in the next few months on the worldwide import sites like Burning Desires, etc., I will let you know, they just always pop up first on the US site since it's a USA company). 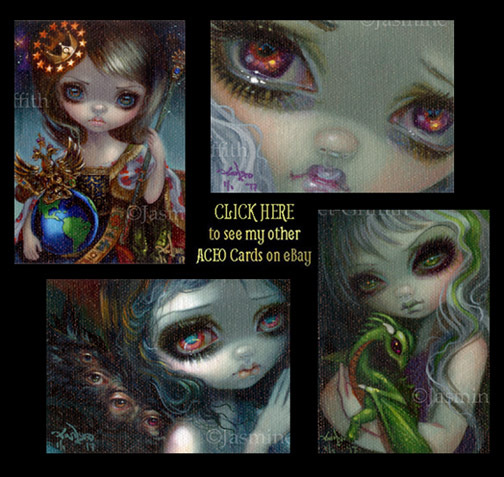 I have a bunch of new ACEO cards up for auction, each also starting at just one penny. Tiny 2.5x3.5" art trading cards in the form of hand embellished canvas giclees - each is signed, dated, hand accented & numbered (numbered only #1 of 1, since only make ONE) in acrylic paint - you can see this new collection of cards (some you have never seen before!) here on eBay. Every week at Strangeling.com we have a new SALE print, always $9.99 - popular paintings from years past, new personal favourites - it changes each week. Always signed on the back by me personally! 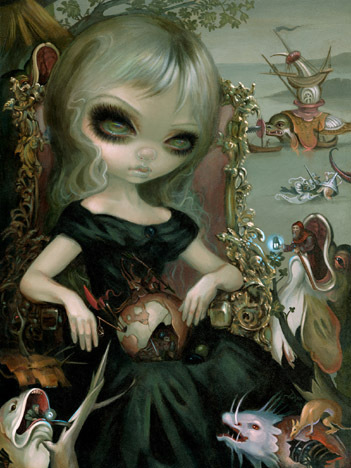 Check back on the Strangeling.com front page each Monday to see what the new sale print is! We always ship worldwide. 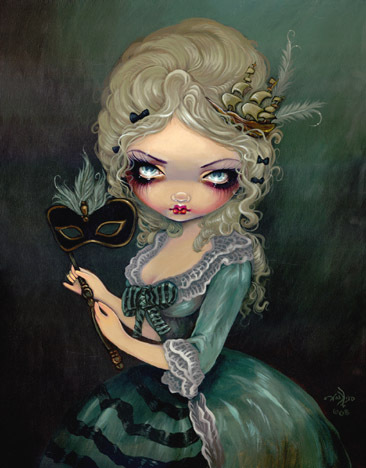 This week it is "Marie Masquerade!" The original and limited editions sold out long ago, but the glossy photo paper prints signed by me on the back are only $9.99 this week, and the open edition canvas prints (with a signed certificate on the back!) are only $90 - could make an amazing Valentine's Day gift! Click here to see her!